My mom tells me that I was in second grade, which would have made me a Wolf in Cub Scouts. My pack, along with the others scattered across Nashville, was participating in a city-wide contest. We were to sell chocolate bars. Time has erased most of the details. The chocolate bars themselves, however, I remember clearly. Shaped like longer, skinnier gold ingots, a trapezoid if you looked at one end dead-on, those bars would have been more plausible as paper weights than sweets. The packaging certainly bespoke quality: chocolate folded in foil and the foil sheathed in paper. But appearances can be deceiving, particularly in the realm of politics and candy. Like me, you would have noticed the chocolate’s unhealthy pallor. They had a peculiar grayish tint. They tasted worse than they looked: like a brown crayon; an old brown crayon, interred for a couple of decades before being rinsed with creek water. The manufacturer must have mixed up the percentages of food wax and cocoa powder in the recipe. I couldn’t finish one bar. Another distinct memory is the rotary phone mounted to the kitchen wall above a small wooden desk. The phone and desk made up the whole of my business operations. And now we reach the crux of the story. When that hazel-eyed kid with blocky joints, prominent ribcage, and an extra dollop of stubbornness heard about the prize, he went to work. He opened the Harpeth Hills Church of Christ membership directory, he picked up the phone, and he dialed the first number I saw. My parents tell me that I called my way from A to Z. To my knowledge, they didn’t tell me to sell to people from church. I arrived at the idea on my own, and if I know my parents, paragons of respectability, they felt ill-equipped to manage my sudden zeal for bland chocolate. Every call raised the number of covert apologies they would have to make on Sunday morning. Not that my parents would have sabotaged my one-man candy-hawking campaign. Far from it. They were always supportive, always ready to assist. But this was to become a motif of my childhood… My parents consternation, then wonder, then pride, when their little guy hatched new scheme. Sometimes, they were able to talk me out of bad ideas—most notably, my fur trapping enterprise. My boundless optimism could easily blind me to reality: No fur-bearing animal of any species that lives in the moderate climate of Tennessee has a pelt thick enough to be usable by any producer of any garment for any person. No, the deal-breaker was startup costs. My parents wouldn’t front me the capital. But chocolate? I could pre-sell chocolate! No traps, skinning boards, or special implements required. I sank my teeth into the idea, and soon enough, my parents must have thrown up their hands and asked how they could help. Along with the other winners, I was herded into the dugout before the game. Herded out onto the field. Planted on the dirt. Herded back into the dugout. And then reunited with my parents, who were, no doubt, beaming. It’s not like I cared much about baseball at the time, or later. 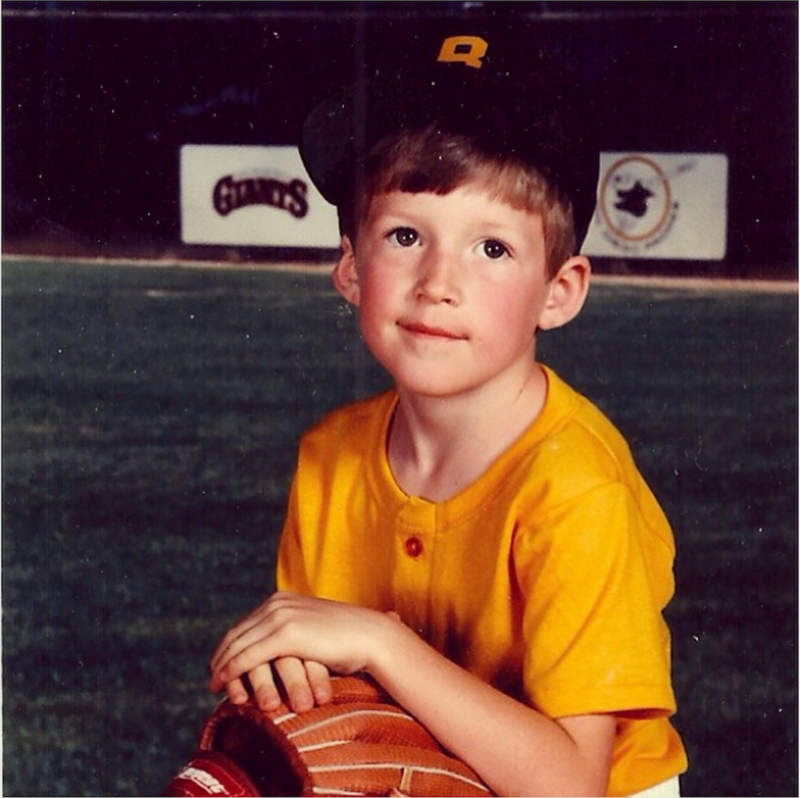 As a Little League player on the Orioles, I distinguished myself with various unofficial superlatives, including Most Likely to Chase Butterflies, Most Likely to Hunt for Four-Leaf Clovers During Gameplay, and Most Likely to Win the Game by Being Hit by the Ball. 1) Because of my batting history, no one expected a real hit. 2) I wanted to help my team, and if I had struck out, I would have been disappointed and embarrassed. 3) My parents didn’t want me to be disappointed and embarrassed. 4) The pitcher hit me in the head. 5) Because I was wearing a helmet, I wasn’t actually hurt. 7) Because I wasn’t hurt, my parents were relieved. 8) Because getting hit resulted in an automatic walk, I got on base. 9) Because I got on base, I wouldn’t be disappointed and embarrassed. 10) Because I wasn’t disappointed and embarrassed, my parents were doubly relieved. 11) My walk drove in the winning run, and I became an accidental hero. This was perhaps the crowning achievement of my brief career in baseball. Yet, I wanted to be out on that baseball diamond with a professional baseball players, and I was willing to forget my bug collection and put down my fishing rod long enough to make several hundred phone calls. Hopefully, the money from my juggernaut sales operation helped to fund worthy projects around the city because I think it likely that many of my customers received diarrhea for their generosity. Boy Austin understood and practiced this. He felt no shame about asking. He hadn’t yet learned to associate asking with being needy. He hadn’t faced much rejection, true, but he didn’t let the thought that some people might not want waxy chocolate stop him from at least giving them the option. I had a beautiful ignorance of “how the world works,” and I assumed that people would want to help me. Why wouldn’t they? Asking for help is an essential skill for entrepreneurs. In fact, asking for help can mean the difference between success and failure. Kids have no choice. They have to ask for help because they cannot reach that toy, tie those shoes, or buy that origami paper that they will subsequently transform into throwing stars and sell to classmates for $1 a pop. For children life is others-reliance, not self-reliance. And I now believe that the truth of others-reliance doesn’t really change as we get older. Others disappoint us. We disappoint ourselves. We trust self-reliance, and like turtles we withdraw into the seeming safety of carapaces. We take too much pride in self-reliance. We pull away from people with the willingness and capacity to help us. We limit ourselves to our own capacity when we could be learning from others, leaning on others, and leaping forward. What’s more, people who don’t have the same qualms about asking for help pique our sense of fairness. We resent both their freedom and the help they receive. The safety becomes a trap. Professor Frank Flynn, a professor at the Stanford Graduate School of Business, published a study that backs up Baker’s observation. Flynn found that most people downplay what others know and underestimate their willingness to help. In other words, other people know more than we think. They are more eager to help than we realize. Their access to helpful information and resources will surprise is. The smart thing to do is to ask for help. Again, asking comes naturally to children. My niece, with knees knocking, asked me if I wanted to buy Girl Scout Cookies. I prefer to make my own cookies from scratch, yet I was delighted! I bought several boxes, and I told her that if she was getting close to her deadline and hadn’t met her goal, then I would buy more. We know that asking for help works because we have been on the receiving end of requests. When people ask you for help, do you shun them? Do you spit on their requests? Do you humiliate them and harp on their weakness? No. More often than not, you do what you can to help. Why? Helping others feels good. We like to help because we know what it’s like to be in need. In fact, one reason that I help less experienced freelancers is that I know how crucial Andrew Gordon’s advice was back in 2009. Obstinate self-reliance takes a toll. Not asking for help, and working in an environment where asking for help is discouraged, quite literally makes people sick. Good research has shown that a culture of fear and back-biting leads to stress, lost productivity, errors, more missed work days, higher turnover, and disease. Of course, leaders shape culture, and good leaders create a culture of safety. They make it okay to ask for help. Don’t take my word for it. Jonathan Haidt at New York University’s Stern School of Business found that fair and self-sacrificial leaders (and the culture they create) inspire deeper loyalty and commitment in their teams. So there you have it. Asking for help is a sign of strength, not a weakness. If you want to succeed, ask for help. If you want to succeed, help others. If you want to be a successful leader, make it okay to ask for help. Your people cannot be successful if they are afraid to ask for what they need. I can look back on so many missed opportunities: I could have asked for help, but I chose to go it alone. I chose to protect some perverse form of pride. Eight-year-old Austin just picked up the phone and asked people to buy crappy chocolate. Eight-year-old Austin has something to teach me. Maybe he has something to teach you too. Go ask for help. You’ll succeed faster. P.S. Thank you, Jordan and Nathan, for saying something when you saw adult Austin trying to be too independent. Thank you for reminding me to be more childlike.